The 10 Year Treasury yield tested the prior high in the 3% area after the Fed announcement that their dollar busting Quantitative Easing program will be scaled back by 10 billion of the current 85 billion US dollars in January. Few expected it. It does displace the full blame for the “QE Taper” from the incoming Chair of the Fed, Dr. Janet Yellen. This caused rates to rise to test the 3% area, but by Friday they were back down near the Weds. close the day of the Fed announcement. The Fed did taper QE, yes, but not dramatically, so rates could still experience enough downward pressure to satisfy the bond market. A rise to a new yield high would negate this notion, so continue to follow the 10 year Treasury yield with me. Rising rates hurt the gold ETF, GLD, this past week once again as you can see at the link to the right. Test of 3% area and followed by a pullback. 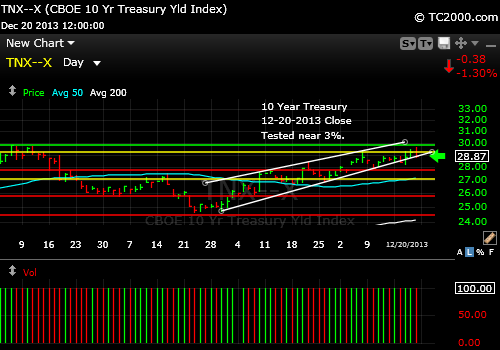 This entry was posted in Bonds, investment, Treasuries and tagged 10 year treasury, market timing, tnx. Bookmark the permalink.